The Roaring Fork River flows past the handicapped fishing access at Veltus Park Friday morning. A new shoreline restoration and enhancement study presented to the city proposes several ways to improve access to the river from both Veltus and Two Rivers parks in Glenwood Springs. A wider Two Rivers Park boat ramp, terraced riverbank, foot trail and beach areas along the Colorado River are envisioned as part of the city of Glenwood Springs’ newly released river parks shoreline enhancement study. Likewise, Veltus Park on the Roaring Fork River could see similar riverbank improvements and better access under the new long-term plan, which was formally accepted by City Council on Thursday. The Shoreline Restoration and Enhancement report is the culmination of an effort that began over the summer with a user survey and a series of community meetings this fall to discuss ways to improve the shoreline areas in Two Rivers and Veltus parks. Working with Gary Lacy of Boulder-based Recreation Engineering and Planning, city parks officials have come up with a plan that could lead to around $1.3 million in improvements in the coming years aimed at making the riverbank areas more stable, attractive and accessible. The next step, according to Glenwood Springs Parks and Recreation Director Tom Barnes, is to go after various grants to begin to realize some of the new amenities. “If there was demonstrated community support with people coming out and advocating for this, we could start to put some of those pieces in place next year,” Barnes said, adding no money is budgeted yet to do any of the work. “We’re probably looking at a 2016 and 2017 project period if everything fell into place,” he said. Some of the work that’s proposed in the plan could also conceivably dovetail with the upcoming Grand Avenue bridge construction, Barnes said, in that some of the material removed from the river as part of the bridge project could be used for riverbank stabilization. A major component of the shoreline improvements plan would be the replacement of the existing, undersized boat ramp in Two Rivers Park with a wider ramp that could accommodate more users. That was a key outcome of the surveys and comments during the community meetings, which generated a fair amount of input from river users in particular. The current facility is often highly congested during the peak summer months when private and commercial rafts, kayaks, fishing boats and other watercraft compete for limited space at the popular take-out and put-in spot on the Colorado River. Parking and restroom facilities are also inadequate, and there are numerous safety concerns and occasional conflicts between different users, the report notes. The proposed new concrete boat ramp would have two 15-foot-wide lanes with an 8 percent slope down to the river that would accommodate two boat trailers at a time. In addition, the ramp would have a separate stair-step access and other terraced riverbank areas on either side of the ramp for putting in and taking out smaller watercraft that don’t require a trailer. “Improvements to the eddy that complements the boat ramp are also suggested,” according to the report. A new, permanent restroom facility is also proposed near the boat ramp to replace the existing portable toilets there now. For pedestrian and fishing access, a soft foot trail and mini beach areas are also proposed, extending upstream from the boat ramp to the pedestrian bridge at the confluence with the Roaring Fork River. 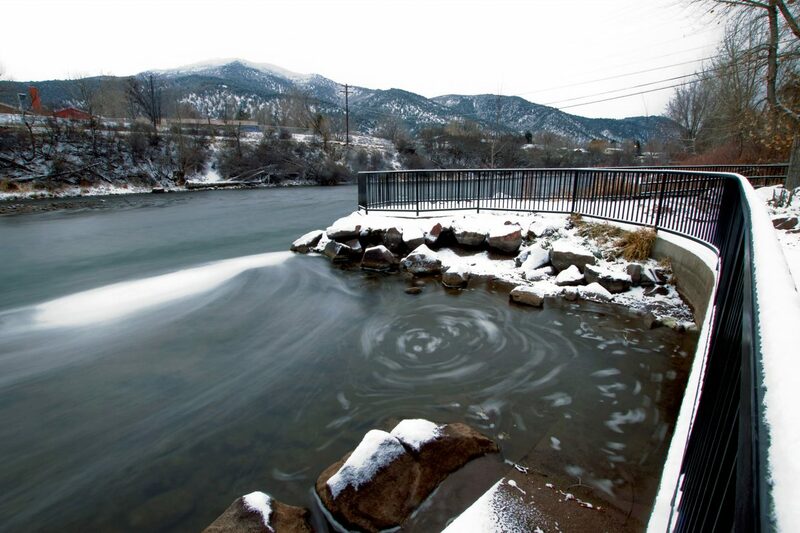 The Roaring Fork riverfront in Veltus Park also must be stabilized to prevent further erosion, the report concludes. Access to the river in that park could also be improved by similar rock terracing and removal of the handrail along the downstream side of the existing concrete walkway to provide better river access. The shoreline plan is specific to the approximately 25-yard area extending from the water’s edge to the grassy park areas, and did not address other types of park improvements. The project was paid for by a $36,000 Great Outdoors Colorado planning grant, plus $12,000 from the city.